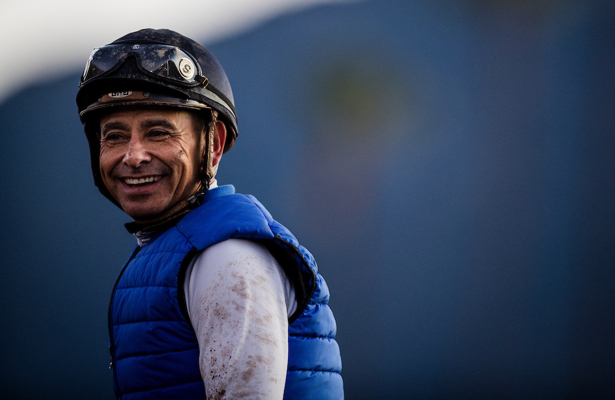 Jockey Mike Smith says he’s been blessed to ride the amount of big horses he has this year. But as they meet in the same Breeders' Cup races, it made for two tough decisions. Smith is sticking with the 3-year-old McKinzie in the Breeders’ Cup Classic over West Coast, and he’ll pilot Abel Tasman in the Breeders’ Cup Distaff instead of Midnight Bisou. The jockey admitted he's not sure whether he made the the right decisions. When it came to his Classic decision, Smith said he risked losing the mount to another rider if McKinzie won without him. That horse will remain in training next year, while the 4-year-old West Coast is off to stud. John Velazquez will instead ride West Coast. Smith was also aboard for McKinzie’s return race Sept. 22, when the pair won the Pennsylvania Derby (G1) together. It was McKinzie’s first race in over six months following his lone defeat in five starts. Even though the Classic will be McKinzie’s first race against older horses, plus longest yet at 1 1/4 miles, Smith believes there’s still a lot of talent McKinzie has yet to showcase. In the Distaff, Smith is going with the older filly in Abel Tasman over 3-year-old Midnight Bisou, who he won the Cotillion (G1) with when Monomoy Girl was disqualified to second. Velazquez also inherited that mount. Smith was the regular jockey when Midnight Bisou was trained in Southern California by Bill Spawr and retained the mount when she moved East with trainer Steve Asmussen. Smith also said to cross out Abel Tasman’s last race, in which she flopped in the Zenyatta (G1) at Santa Anita and finished fifth. He speculated it could have been a sickness going around the barn or a result of running extra hard when out-dueling Elate in the Personal Ensign (G1) a race earlier. Smith and Abel Tasman were also 7 ½-length winners in the Ogden Phipps (G1) before heading to the Personal Ensign. They paired to win the 2017 Kentucky Oaks and sit a 7-2 morning line second choice behind this year’s Oaks winner, Monomoy Girl, in the Distaff. The Distaff and the Classic are both scheduled for Saturday at Churchill Downs. The Classic will be the grand finale of the 14 Breeders’ Cup races this weekend, and Smith is already wanting to get rolling on McKinzie.